Join Cope, Marsh, Williston, the Sternbergs, H. T. Martin and the many others who have reported on fossils of the Midwest. Bader, K.S. (2), Natural History Museum and Department of Geology, University of Kansas. TRACES PRODUCED BY INSECTS ON BONE Subaerially exposed carcasses attract insects that rapidly consume flesh. During the final stage of decomposition, insects consume or modify the remaining dry skin, flesh, and bones. Modern examples of insects that damage bone include dermestid beetles, tineid moths, and termites. Dermestid beetle larvae consume bone after the flesh and skin is removed from desiccated carcasses. After feeding for approximately 4 weeks, Dermestes larvae produce pupation chambers with U-shaped cross-sections in hard substrates such as bone. Tineid larvae feed on keratin and construct protective chambers by boring into the underside of a bone and covering it with a hard layer of feces, keratin, and bone fragments. Termites protect themselves by encasing their galleries and food sources in stercoral, a mixture of soil, feces, and saliva. Aboriginal skeletons from the Carnarvon range of Australia are found encased in stercoral with individual bones damaged or destroyed. Laboratory experiments have proven that termites can scratch bone with their mandibles, although there is no evidence suggesting that termites consume bone. Similar insect traces have been identified on dinosaur bones from the Upper Jurassic Morrison Formation of northeastern Wyoming. Unlike modern traces produced by tineid larvae and termites, a protective material does not cover the fossil traces. The most common trace is a shallow pit produced by a feeding insect or an insect anchoring its pupation chamber against the bone. U-shaped pits on the dorsal vertebrae of a Camarasaurus are identical to dermestid pupation chambers. Beatty, B. (3) and L.D. Martin, Museum of Natural History (BRC) and Department of Ecology and Evolutionary Biology, University of Kansas. AN ANTILOCAPRID FROM THE ARIKAREEAN (EARLY MIOCENE) OF WYOMING. The discovery of a mandible of an extinct pronghorn (KUVP 48020) in the lower portion of the Harrison Formation just north of Van Tassel Wyoming, extends the documented range of antilocaprids to over 21 millions years. This is an increase in age of about 20%. The appearance of antilocaprids in the fossil record is one of the datum points for calibrating the molecular trees describing artiodactyl evolution and the new datum point will affect such analysis. The appearance of antilocaprids is also one of the defining events for the Hemingfordian Land Mammal Age and the new discovery indicates that their emigration to North America is actually part of an earlier emigration pulse. Beckemeyer, R.J., Research Associate, Johnston Geology Museum, Emporia State University. LOOK AT ME OR TRY TO FIND ME? THOUGHTS ON WING COLOR PATTERNS IN PERMIAN INSECT FOSSILS. Since insect wings are composed principally of chitin, they are often discarded rather than eaten by predators and they are also more resistant to decomposition than other body parts. Consequently, most compression fossils of Paleozoic insects are wings. Rarely, beautiful and well-developed color patterns have been preserved in insect wing compression fossils. Some examples of wings with preserved color patterns from the Lower Permian beds of Kansas and Oklahoma will be presented. In extant insects, wing color patterns may make an insect stand out visually, or may provide camouflage. In this paper recent literature on wing color pattern formation and development, and on correlations between color patterns and the biology of extant insects, is reviewed and used as the basis for speculations about the taphonomy of these insect wing fossils and about the biology of the Paleozoic insects. Burnham, D.A. Department of Geology, University of Kansas. FUNCTIONAL INFERENCE FROM TAPHONOMICAL EVIDENCE. Taphonomy of articulated fossil vertebrate skeletons provides insight regarding functional morphology. Since articulated skeletons infer they were still held together by connective tissues before final burial, they reflect closely the life positions of bony elements. Therefore a certain death posture implies the living animals capability to position limbs accordingly. The preserved death posture should reflect the lifestyle of the animal if it is congruent with the ranges of motion allowed by its functional morphology. In particular, certain groups of animals appear to exhibit characteristic death poses when fossilized. For instance, a hindlimb sprawling posture usually found in bird fossils is also found in some of the small, four-winged dromaeosaurs from the Early Cretaceous of China. These specimens have been described as birdlike dinosaurs and are referred to as Microraptorians. Notably, this pose is almost never found in other dinosaurs, a group exemplified by upright posture. The sprawling posture allows Microraptorians to function as gliders using the hindlimbs as a second set of wings held in the same plane as the fore wings. This scenario would be consistent for trees down origin of flight in which a sprawling, arboreal ancestor is fundamental. This is in contrast with a morphological phylogeny suggested by other workers that place dromaeosaurs as highly derived, small theropodeous cursors and ancestral to birds. Their phylogenetic framework would evolve birds and their flight from the ground up. Ducommon, J. (2), C.D. Burke, and S. Hamm, Department of Geology, Wichita State University. SPECIES AFFINITY OF A JUVENILE DURANIA (RUDISTID) FROM THE SMOKY HILL CHALK MEMBER OF THE NIOBRARA FORMATION IN WESTERN KANSAS. A colonial, juvenile Durania specimen from the lower Smoky Hill Member (Late Coniacian) of the Niobrara Chalk in Gove County, Kansas was compared to adult forms of Durania cornupastoris (Des Moulins) from the older Greenhorn Limestone near La Junta, Colorado (Early Middle Turonian) to clarify species level affinity. Because pelecypods characteristically grow by accretion, juvenile specimens should simply be small versions of mature adults and shell morphology should reflect this growth strategy. Morphologic criteria for species level assignment within the genus Durania are based upon number and size of radial bands and interbands. For this study, morphologic measurements were acquired from all specimens. Where available, measurements included commissural diameter, inner diameter of outer shell, ventral radial band, interband, posterior radial band, and height of right (attached) valve. All measured morphologic traits among the D. cornupastoris adults from Colorado and the juvenile specimen from Kansas displayed a ratio of 4:1. Consequently, the Durania juvenile from Kansas is a smaller version of adult D. cornupastoris based on these morphologic criteria. Historically, all Durania specimens found in Kansas Cretaceous strata have been classified as Durania maxima (Logan). Based on the results of this study, this nomenclatural convention has little morphologic support, and suggests that species level taxonomy of the genus Durania is in serious need of revision. Everhart, M.J., Sternberg Museum of Natural History, R. Decker and P. Decker, Mankato, Kansas. EARLIEST REMAINS OF DOLICHORHYNCHOPS OSBORNI (PLESIOSAURIA: POLYCOTYLIDAE) FROM THE BASAL FORT HAYS LIMESTONE, JEWELL COUNTY, KANSAS. The Fort Hays Limestone Member of the Niobrara Chalk was deposited in the Western Interior Sea during the maximum transgressive phase of the Niobrara Cyclothem (early Coniacian). The water was relatively deep, well-aerated and far enough from shore as to be beyond the influence of terrestrial sediments. The member ranges from 17-24 m in thickness and consists of several relatively resistant beds of chalky limestone separated by thin layers of chalky shale. Although rich in invertebrate remains, the Fort Hays has produced few vertebrate specimens. 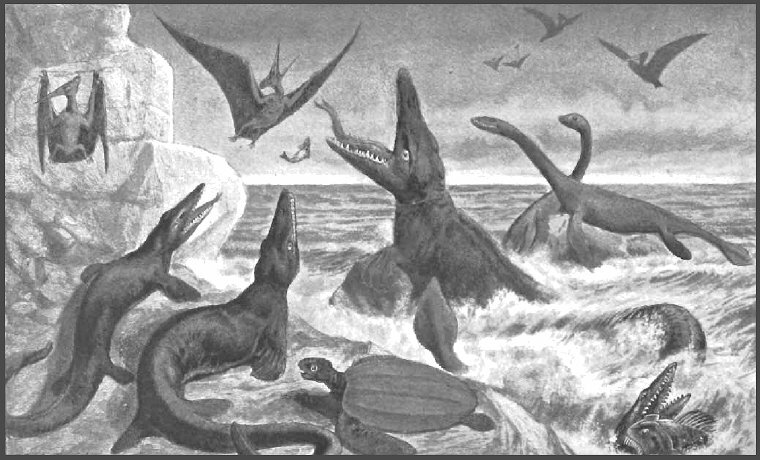 In 2005, polycotylid plesiosaur (Dolichorhynchops osborni) remains were collected from the basal Fort Hays in Jewell County, Kansas. The specimen (FHSM VP-16459) consists of a semi-articulated series of 24 dorsal vertebrae, pelvic and pectoral girdle fragments, ribs, and distal limb elements. Dolichorhynchops was previously known from the Campanian age Smoky Hill Chalk and Pierre Shale, although fragmentary remains of polycotylids have been reported from the upper Coniacian. 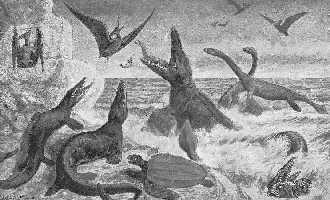 The new specimen is only the second plesiosaur and the third marine reptile collected from the Fort Hays. Remains of Xiphactinus, Cimolichthys, Protosphyraena and several species of shark teeth have been collected by the authors from the same stratigraphic level. The new specimen significantly extends the temporal range of Dolichorhynchops and adds to our knowledge of the faunal diversity of the Western Interior Sea during early Coniacian time. Everhart, M.J., Sternberg Museum of Natural History, and E. M. Manning, Tulane University. 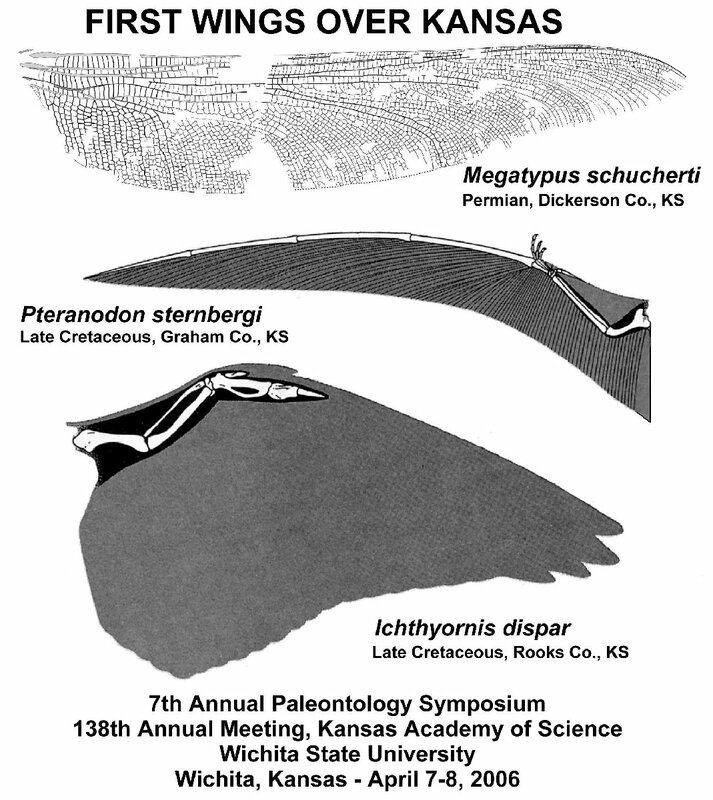 DR. GEORGE MILLER STERNBERG: THE FIRST STERNBERG FOSSIL HUNTER IN KANSAS. Charles H. Sternberg and his sons, George F., Charles M. and Levi are recognized today as one of the 'dream teams' of paleontology for their collecting work in Kansas, and elsewhere in the United States and Canada. Few people realize that Charles H. Sternberg had an older brother who was actually one of the first fossil collectors in north central and northwestern Kansas during the late 1860s. Dr. George Miller Sternberg (1838-1915), an Army surgeon assigned to Fort Harker (1866-67) and the Indian campaign in western Kansas and the Oklahoma Territory (1868-69), collected fossil leaf imprints from the Dakota Sandstone, and shark teeth, fish, turtle and mosasaur remains from the Niobrara Chalk and Pierre Shale. 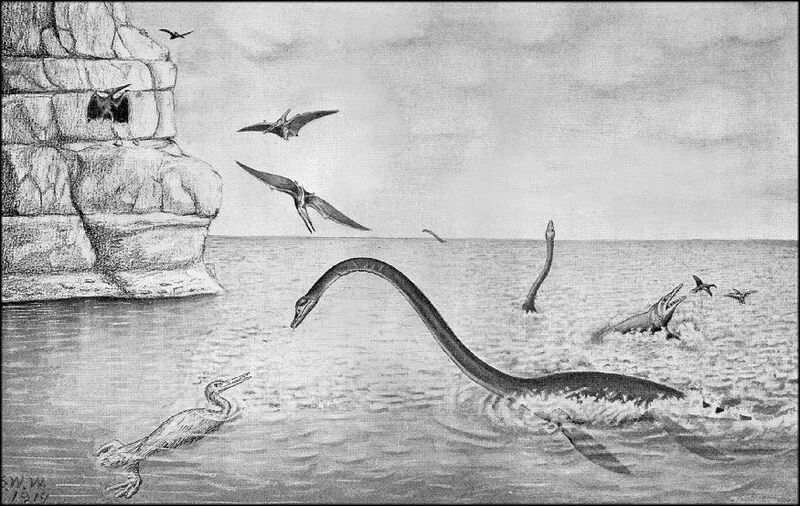 He discovered the type specimen of the giant Cretaceous fish, Xiphactinus audax Leidy 1870, and more than 40 marine reptile specimens now in the United States National Museum (Smithsonian) collection. While in Kansas, Dr. Sternberg arranged for his parents and siblings to take up ranching on his land near Fort Harker, and encouraged young Charles Sternberg's interest in fossils. 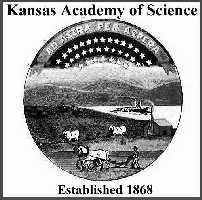 At the first meeting of the State Natural History Society (now the Kansas Academy of Science) in 1868, Dr. Sternberg was elected an honorary member. Later in his military career, Dr. Sternberg made important discoveries in the control of communicable diseases and was the Surgeon General of the Army from 1893-1902. Hemmy, A.S., Natural History Museum, Division of Vertebrate Paleontology and Department of Geology, The University of Kansas. MANAGING FOSSIL QUARRY DATA USING DIGITAL DATABASE TECHNOLOGY COMBINED WITH TRADITIONAL TECHNIQUES. The University of Kansas has operated a fossil quarry (MY-140) in the Jurassic Morrison Formation of Northeast Wyoming since 1997. The quarry has yielded distinct articulated skeletons as well as exceptionally preserved partial skeletons from sauropod, theropod, and ornithischian dinosaurs. There are also many isolated elements from a wide variety of fauna; including turtles, crocodilians, fish, small reptiles, and mammals. The quarry also contains a floral component in the form of seeds and cones. In the intervening nine years an incredible amount of data has been accumulated by several individuals in the form of field notes, illustrations, photographs, bone maps, and high quality video. In order to manage this unique site we combine the stratigraphic and paleontological data into a single, easily accessible database. Aerial photographic data are referenced against photographs taken during previous excavations, in order to place the individual bone maps within the larger quarry system. Then existing bone maps are digitized and combined using ArcGIS software and assigned the necessary attribute information. We envision a database containing all the relevant information pertaining to the quarry. Future research will include creating the quarry in 3-dimensional space, further investigation of taphonomy and stratigraphy, and the identification of the lateral extent of the site. Platt, B.F., and S.T. Hasiotis, Department of Geology, University of Kansas. ELEPHANT FOOTPRINTS AS MODERN ANALOGS OF SAUROPOD DINOSAUR TRACKS: EXPERIMENTAL DESIGN AND PRELIMINARY RESULTS. Modern analogs are useful for studying the track-making dynamics of extinct animals. Studies of theropod dinosaur locomotion and footprints, for example, have been conducted with flightless birds, which are the closest modern analogs to theropods and produce strikingly similar footprints. Elephants are cited frequently as the closest modern analogs to sauropod dinosaurs, yet very few studies of sauropod tracks and locomotion have utilized live elephants. We compared elephant footprints at the Topeka Zoo with sauropod dinosaur tracks in the Upper Jurassic Morrison Formation, Bighorn Basin, Wyoming, and in the literature. Although elephant tracks and sauropod tracks are not identical in morphology and size, they record similar substrate-deforming behavior and appear as similar sedimentary structures. The comparison of elephant and sauropod tracks makes is possible to analyze the role that substrate conditions play in the preservation of these tracks. We developed an experimental design to quantify the relationship between substrate grain size, moisture content, bulk density, footprint volume, and trackmaker weight using multiple regression analysis. This experiment will be conducted with live elephants at the Topeka Zoo, Topeka, Kansas, and will provide estimates of substrate moisture from Late Jurassic sauropod tracks. We collected data from several elephant footprints preserved in different grain sizes and moisture contents during preliminary studies at the zoo. These data, although sparse, show a proportional relationship between moisture and track volume. Retrum, J.B., S.T. Hasiotis, and R.L. Kaesler, Department of Geology, University of Kansas. NEOICHNOLOGICAL EXPERIMENTS WITH FRESHWATER OSTRACODES. Neoichnological experiments with freshwater ostracodes allow documentation and description of different morphological trace types and their associated behavior in a variety of water depths and substrates. In uncompacted, very fine-grained to medium-grained sand substrates the nektobenthic freshwater ostracode Heterocypris incongruens produced a variety traces that are comparable to numerous ichnotaxa. None of the ostracode traces exceeds a depth of 1 mm. Four distinct kinds of crawling trail traces occurred. The most common crawling trails consist of random, sinuous trails with loops and are similar to Gordia and Haplotichnus. Traces with a medial ridge resemble Cruziana. Crawling trails with overlapping loops are comparable to Mermia. Trails with parallel sets of scratch marks are similar to Harpepus and Mesichnium, and zigzag trails resemble Treptichnus. Resting traces that occur as teardrop depressions are similar morphologically to Sagittichnus, and asymmetrical U-shaped ostracode burrows resemble Phycodes. Shallow bioturbation by ostracodes may produce the ghosting effect and cryptobioturbation of laminated sediments in freshwater settings. The preservation potential of ostracode traces in freshwater environments is poor. Ostracode traces are preserved best when they are formed either below wave base and buried rapidly or prior to desiccation in an ephemeral environment. After complete desiccation, only gross morphology of the traces can be observed. The study of modern ostracode traces allows their identification in the fossil record and assists with the interpretation of paleoenvironments and the makers of previously described ichnotaxa. Smith, J.J. and S.T. Hasiotis, Department of Geology, The University of Kansas. MORPHOLOGIC AND PALEOENVIRONMENTAL IMPLICATIONS OF ADHESIVE MENISCATE BURROWS (AMB), PALEOGENE WILLWOOD FORMATION AND OTHER CONTINENTAL DEPOSITS. Adhesive meniscate burrows (AMB) are abundant in alluvial paleosols of the Paleogene Willwood Formation, Bighorn Basin, Wyoming. AMB are sinuous, variably oriented, cylindrical burrows composed of a nested series of distinct, half-ellipse-shaped packets containing thin meniscate laminae, where each packet is outlined by a wall thicker than the laminae it contains. The burrows are termed adhesive because they do not weather differentially from the surrounding matrix and cannot be removed easily as individual specimens. AMB in the Willwood Formation are most abundant in moderate- to well-developed paleosols with high concentrations of rhizoliths. Identical burrows are reported from paleosols in the Triassic Chinle Formation and the Upper Jurassic Morrison Formation. AMB were constructed most likely by burrowing insects based on their morphology and comparison with similar structures in modern soils. Extant burrowing insects excavate elliptical chambers in the well-rooted A and upper B horizons of soils that range from 7-37% in moisture content. AMB have been assigned to other backfilled ichnogenera, however, this study demonstrates that AMB are morphologically distinct. In addition, while backfilled burrows are reported mostly from marine strata, AMB appear exclusively in pedogenically modified continental deposits. Thus, AMB in outcrop and core can be used to differentiate alluvial paleoenvironments from marine and lacustrine paleoenvironments, as well as indicate periods of subaerial exposure of strata deposited in aquatic settings. Williams, D.R., Department of Ecology and Evolutionary Biology, University of Kansas. THE FOSSIL LEPORIDAE OF NATURAL TRAP CAVE, WYOMING. Natural Trap Cave is a 26 meter-deep sinkhole in Madison (Mississippian) Limestone on the western slope of the Big Horn Mountain that has been trapping animals for an indeterminate length of time, possibly as early as the Sangamonian interglacial. During the excavation of the cave, stratification was noted and specimens were collected in depth intervals to take advantage of this. Leporids recovered from these intervals can be a useful tool in interpreting climate change in the area due to their specific habitat requirements in the modern biota. The leporid fauna includes Lepus arcticus (arctic hare), now found in the Canadian tundra, which is not known from any other Wisconsin-age locality in the United States. Dicrostonyx torquatus, another tundra indicator, has also been found in Natural Trap Cave. Species found in the area today, such as Lepus townsendii and Sylvilagus audubonii, are also present in the cave. The taphonomy of the remains identified in this ongoing study suggests that much of the leporid fauna was introduced in carnivore feces or stomach contents due to the frequent occurrence of acid etching on mandibles. Additional post-crania lack acid etching or obvious digestion features, so some of the fauna may have been cave accidentals. This brings into question the trapping radius around the cave, and the leporids must be interpreted with this in mind. Van Iten, H. Department of Geology, Hanover College, *Lichtenwalter M. Department of Geology, Wichita State University, Moraes Leme, J. Department of Sedimentary and Environmental Geology, and Guimarães Simões, M. Department of Zoology, São Paulo State University. Microscopic Remains of Phosphatic Macro-Invertebrates in the Uppermost Maquoketa Formation (Upper Ordovician) of Northeastern Iowa. Estimates of the original taxonomic diversity of fossil macro-biotas are subject to taphonomic and other biases. Taphonomic biases, which can be particularly strong in shallow shelf deposits, can be mitigated in part by analysis of the taxonomic diversity of associated microfossils. In the Upper Mississippi Valley, the uppermost Maquoketa Formation (Upper Ordovician) consists of a shale-dominated shallowing upward sequence capped by an interval (the Cornulites zone) of alternating thin shales and richly fossiliferous lime packstones and grainstones. The limestones probably were deposited under the influence of storm currents. Low magnification point counts of macrofossil specimens exposed on limestone slabs collected near Brainard, Iowa, revealed several major taxa. Examination of formic acid residues of the limestone samples revealed additional, phosphatic fossils, namely conodont microfossils and fragments of originally macroscopic conulariids and Sphenothallus Hall. Also present are phosphatic fragments of uncertain identity, possibly pieces of inarticulate brachiopod. Neither conulariids nor Sphenothallus have previously been reported from any part of the Brainard Member. The phosphatic skeletons of these taxa may have been more susceptible to mechanical disintegration than were the calcitic skeletons, and both the phosphatic and the calcareous fossils probably represent transported remains of the same or contiguous bottom faunas.